On the farm, you’re likely never very far off from having to plug the next leak. The tire on the planter, the head gasket on the service truck or that hydraulic hose on the tractor; it seems like there is always something leaking, at least that’s how it was around our place! The instance that comes to mind from my childhood is that of a small, leaking cattle pond on a piece of ground dad bought. 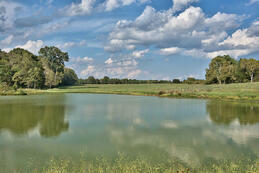 When the spring rains came that pond would not only fill up, but it would easily overflow due to its shallow banks. The greater tragedy was that not only could it not hold more of that runoff, but that it also had a slow leak so that by early summer, just as we needed that water the most, the pond was nearly dry. Dad would say that pond got us “comin’ and goin’”. Knowing full well that bemoaning the fact that this scene played out year after year would do absolutely nothing to fix the problem, dad decided to do something to remedy the situation. And as he knew from personal experience the yearly cycle of spring rains and summer droughts so prevalent in western Arkansas, he had high certainty to believe that this cycle would repeat again the upcoming year. His idea to tackle this problem was twofold: plug the leak and build higher sides. He figured he had two options to get this done. Now, on the most “sophisticated” level of repair, he could’ve throw out everything simple that he knew about farm ponds and gone with an outfit that offered a great sounding deal for fixing his problem; for a fee, they’d come out and rebuild the pond from scratch. The thing was, dad understood that even this expensive method provided no guarantee that a new pond using the same old dirt, while able to hold more water, wouldn’t still leak. Instead, he decided to stick with a simple approach that he could manage on his own. We just so happened to have a WWII era D-6 dozer that ran (most of the time) and, just down the road was an outfit that sold bentonite (clay that is used to seal up leaky ponds). So, dad opted for the simple plan and chose to clean out the pond that summer and added the readily available bentonite to seal up the bottom of the pond. Next, he used a common tool that he was very familiar with, that old D-6, to build up the banks of that pond. It was months later before his work bore any fruit but he had history on his side telling him that the rains would indeed come again, and when they did he was able to capture nearly all that Mother Nature had to offer. Dad was a simple man, using simple methods that were readily available and easily understood to accomplish what he had set out to do. This story of simplicity has a strong correlation to farm marketing. 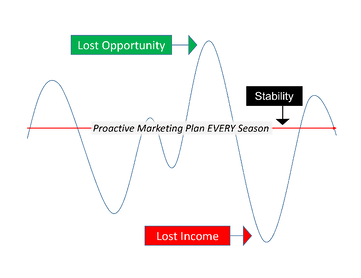 If your grain selling plan seems like a leaky pond that doesn’t capture as much opportunity as you’d like, what are you going to do about it? Bemoaning low prices won’t change things at all, and using “sophisticated”, sometimes complicated grain contracts & strategies are far from a guarantee of obtaining your desired outcome, especially for the cost and/or risk involved. How about keeping it simple? Using the tools readily available to you (such as Target Offers and Forward Contracts) and methods that are easily understood (knowing your breakeven and selling above it during the time each year when the market historically rallies) are not only low risk, they are also low cost, if not outright free, and have a strong historical precedent for working over the long haul (can’t go broke selling at a profit!). the level of profit where you will begin selling your grain. resist the temptation to let the idea of a perfect plan ruin your good plan (keep emotion out of your selling decisions). Taken together, these processes make up a simple and effective profit per acre based marketing plan that is effective in any type of market environment, IF you make the decision to act on your plan; just thinking and talking about it won’t do you any good, I promise. While in better shape than we found it, that old farm pond and its higher banks can’t capture every drop of rain each year, but it does hold enough water to do its job. And with the new sealed up bottom in place, it can carry more of that water well into the summer months, helping the herd make it to the next calving season. Likewise, this simple profit based approach to farm marketing won’t capture all of the upside in the market, but it will keep you from leaking income over the course of the years. Twenty years later that pond is still performing just as dad hoped it would; will your marketing plan perform as you hope it will over the course of your farming career? Simply understood, simply carried out and simply profitable. Interested in learning more about Farm Marketing? We have new courses coming March 2017.